The Naulakha Temple is a large Hindu temple from the 13th Century much ruined but still preserving part of its elaborate decoration. 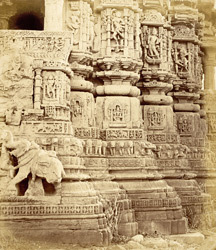 The temple is raised on a finely carved basement with friezes representing kirtimukhas and elephants, horses, birds, snakes intermixed with human figures standing, kneeling, playing and dancing. The sanctuary is surrounded by a passageway and the two-storeys mandapa is supported on elaborately carved columns. The tower over the sanctuary has collapsed. The images set in the niches under the shrine window on the north side are not preserved.